Automation has become a necessity for many electronic producers, making it easy to create a sense of evolution and movement in their music and really keep the listener’s attention. But what exactly is automation? Essentially, automation allows you to map out where in your track you want different parameters to change. A pretty standard example would be automating the volume of an instrument track. This lets you gradually fade parts in or out. Many DAWs have the ability to automate almost anything you want to create cool effects and variations throughout your tracks. 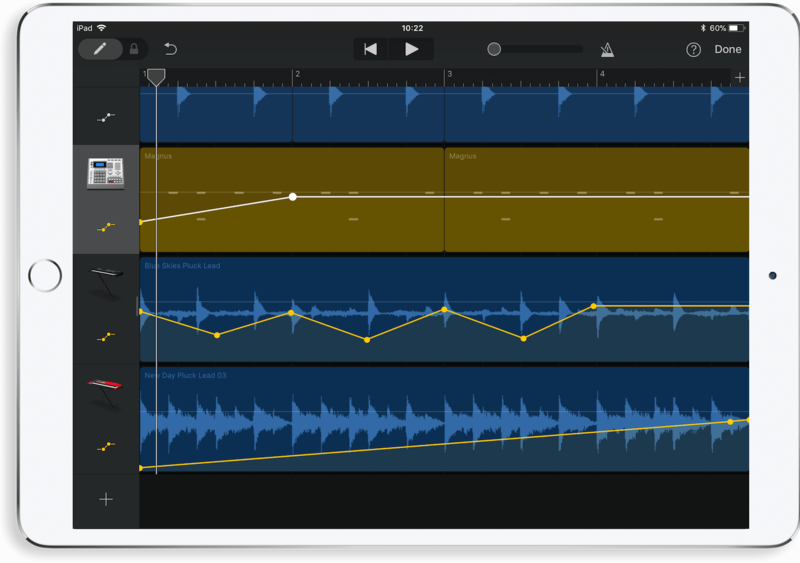 However, with GarageBand on iOS, the only parameter that we can automate is the volume of each track – which is somewhat limiting. But even so, we’re able to create a whole host of interesting effects with just volume automation. Accessing GarageBand’s automation is fairly straightforward. Just tap on one of your track headers on the left and a small menu will pop up. Select automation and you’ll then be able to draw in the automation points you want on any of the tracks shown to increase or decrease the volume. The video below demonstrates how volume automation can be used to bring a track in gradually. The volume automation also lends itself to some more creative applications. For example, in the video below we use GarageBand’s volume automation to create that ‘pumping’ effect that’s common in almost every genre of electronic music. Normally, producers achieve this effect by using a technique called sidechain compression, however, there are no sidechaining options within GarageBand but we can create a very similar effect by using volume automation. As you can see, use automation in GarageBand can be extremely useful and even though GarageBand’s automation options may not be the most flexible, using it in creative ways can really help your music to stand out. If you’re looking to sharpen your GarageBand skills then why not check out our GarageBand Tutorial Series? Covering everything from making your first project to exporting your finished track.